English (Translate this text in English): The Canyon is located 10 minutes N from Dahab. The Canyon is located 10 minutes N from Dahab. English (Translate this text in English): It is a fault/crack that has been formed after a earthquake that touched the Gulf of Aqaba. The entrance of the Canyon is at 18 meters and you drop down until 30 meters. It's partially a overhead environment and from there the divers can go through the crack and exit at a depth of 52 meters. English (Translate this text in English): It is a fault&#47;crack that has been formed after a earthquake that touched the Gulf of Aqaba. The entrance of the Canyon is at 18 meters and you drop down until 30 meters. It's partially a overhead environment and from there the divers can go through the crack and exit at a depth of 52 meters. It is a fault&#47;crack that has been formed after a earthquake that touched the Gulf of Aqaba. The entrance of the Canyon is at 18 meters and you drop down until 30 meters. It's partially a overhead environment and from there the divers can go through the crack and exit at a depth of 52 meters. English (Translate this text in English): It is a fault&amp;#47;crack that has been formed after a earthquake that touched the Gulf of Aqaba. The entrance of the Canyon is at 18 meters and you drop down until 30 meters. It's partially a overhead environment and from there the divers can go through the crack and exit at a depth of 52 meters. English (Translate this text in English): It is a fault&amp;amp;#47;crack that has been formed after a earthquake that touched the Gulf of Aqaba. The entrance of the Canyon is at 18 meters and you drop down until 30 meters. It's partially a overhead environment and from there the divers can go through the crack and exit at a depth of 52 meters. English (Translate this text in English): It is a fault&amp;amp;amp;#47;crack that has been formed after a earthquake that touched the Gulf of Aqaba. The entrance of the Canyon is at 18 meters and you drop down until 30 meters. It's partially a overhead environment and from there the divers can go through the crack and exit at a depth of 52 meters. English (Translate this text in English): It is a fault&amp;amp;amp;amp;#47;crack that has been formed after a earthquake that touched the Gulf of Aqaba. The entrance of the Canyon is at 18 meters and you drop down until 30 meters. It's partially a overhead environment and from there the divers can go through the crack and exit at a depth of 52 meters. English (Translate this text in English): It is a fault&amp;amp;amp;amp;amp;#47;crack that has been formed after a earthquake that touched the Gulf of Aqaba. The entrance of the Canyon is at 18 meters and you drop down until 30 meters. It's partially a overhead environment and from there the divers can go through the crack and exit at a depth of 52 meters. English (Translate this text in English): It is a fault&amp;amp;amp;amp;amp;amp;#47;crack that has been formed after a earthquake that touched the Gulf of Aqaba. The entrance of the Canyon is at 18 meters and you drop down until 30 meters. It's partially a overhead environment and from there the divers can go through the crack and exit at a depth of 52 meters. 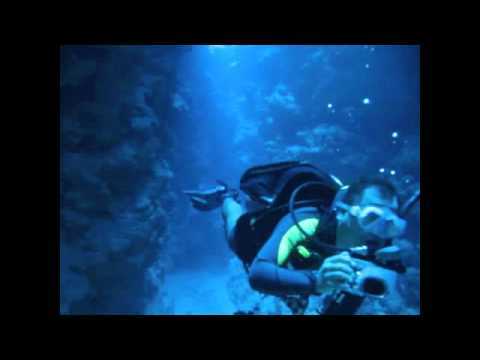 A week in the Sinai Peninsula where I completed my PADI open water and advanced open water. My first dive experience! DO THIS DIVE WITH A MIN. 15L TANK AND DON'T SPEND TOO MUCH TIME IN THE CANYON : WHEN YOU'VE FINISHED DIVING THE CAVE, YOU MUST GET MIN. 90-100 BARS LEFT TO FINISH THE DIVE. HAVE A NICE DIVE !